If you are getting ready for summer, it’s your lucky day. Why, you might ask? By visiting my site, you have stumbled upon an opportunity to win a Verseo eGlide electrolysis hair removal roller and RollerCell2 cellulite massager. This means a chance for no more shaving or waxing, and smoother looking legs. FREE. eGlide electrolysis hair removal roller was first introduced to the market a couple of years ago. Apply the conductive gel to the area you would like to treat, and then roll over the area with the eGlide. With continued use, the hair follicle is damaged, thereby preventing continued growth of hair. This is a much lower cost than laser and less painful than waxing. RollerCell2 cellulite massager takes the same functionality of a salon endermologie tool, but is a portable device for same home use. It comes with a cellulite-reducting gel that you smooth over your skin. The rollers, suctions, and heating mechanisms then work on the skin to distribute the underlying fat cells into a smoother surface. If you want to purchase the Verseo eGlide, the company is offering a special deal for my readers. 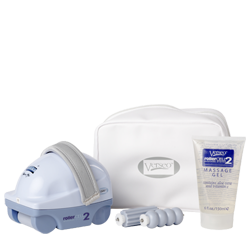 Pay $89.95 for the product and you will receive an extra conductive gel free (a $19.95 value). Follow this link for the special offer on eGlide. If you are interested in the Verseo RollerCell2 cellulite massage system, it can be ordered for $59.95. As a bonus to my readers, Verseo is offering an extra cellulite massaging gel free with purchase ($19.95 value). For the RollerCell2 special, follow this link. To try your luck with winning both products, leave a comment below with your favorite summer vacation location! Contest details: One reader will be chosen at random. Contest ends Monday, May 27th at midnight. Note: This is a sponsored post for Verseo. My favorite Summer vacation spot is home. But I do go back to visit my home town in the San Francisco Bay Area every once in awhile. I love to see the Ocean then go up to the Serra’s to the grand Mountains. Love it. Cool hiking through the redwoods. And every meal made for me (us). I love going to Covina, California, because it’s where my cousins are! Congratulations, Marie! You won! I will contact you via email to get mailing address and your full name. I went to Paris once with my wife and it was so beautiful. It’s my favorite vacation spot. My favorite location to summer and have fun is Tallahassee. It gets super warm there but I have all my childhood friends there and we visit all the local hot spots and just have an awesome time. Thank you so much for the kind words. I look forward to your return! Next post: A Failed Relationship: Who is to Blame?